Barbara Ehrlich White, a prominent art historian, is the star of the night, who now has a star of the knight. 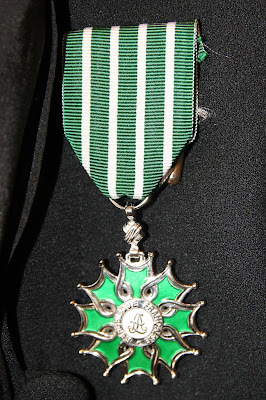 That is, I am there to watch her, surrounded by friends and family and colleagues, be inducted as a Chevalier (Knight) to the Ordre des Arts et Lettres -- the Order of Arts and Letters, an honor bestowed upon her by the French government in recognition of her profound contribution to French culture. This is one of the highest honors that France bestows: the others being the Order of Liberation, National Order of Merit, Order of Academic Palms, Order of Agricultural Merit, Order of Maritime Merit, and the most famous of them all at the top of the list: the French Legion of Honor. This American scholar's contribution to France is in the study and understanding of Impressionism and Impressionist artists, most of them, of course, French, such as Renoir, her specialty. She's a professor emeritus at Tufts University, where she taught art history. And her body of work includes two highly successful books on art history, a subject that usually doesn't exactly sell well, yet her books have sold over 100,000 copies. Renoir: His Life, Art, and Letters and Impressionists Side by Side: Their Friendships, Rivalries, and Artistic Exchanges. The award is given out not in the Elysée Palace but rather in an unassuming building just down the block, in which is located the Jane Roberts Fine Arts gallery. Jane Roberts is no slouch in the Impressionist art world either, a British woman who's been here for nearly 25 years as an art dealer (and writer) specializing in Impressionist and neo-Impressionist art from the 19th and 20th centuries. It is Jane, herself a Chevalier dans l'Ordre des Arts et Lettres (in 2011) who is authorized -- by the power vested in her -- by the French government to conduct the ceremony and give the medal to Barbara. Their mutual admiration is evident in the evening, which is full of warmth, sincerity, and good humor. And of course lovely art, and books on art, everywhere the eye can see. And some pastries and champagne: this is France, after all. There were many people there important to Barbara -- her family and local friends -- and some who are also important in this field, like two great-great granddaughters of Paul Durand-Ruel, Renoir's agent/dealer and the person who almost single-handedly put Renoir on the map, first in the US and then again back in France, where the artist had, until then, largely been reviled by the French. 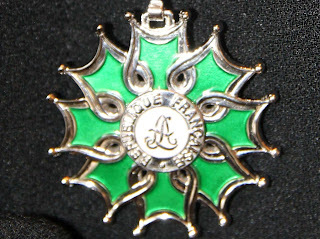 Beside the top honors mentioned above, France also hands out a host of civilian honor medals, including the Medal﻿ for Firefighters, of the National Police, and Wounded Civilians, and even more military medals, such as the Cross for Military Valour, the Escapees' Medal, Resistance Medal, Aeronautical Medal, and Insignia for the Military Wounded, among many others. Besides the many defunct medals, specific to certain wars and time periods, there's also a list of abolished and dormant medals, including the Medal of Postal Merit. Given the fact that my local post office is nearly always closed, I am not surprised that nobody at the Post Office has merited this in recent years. Several of us get talking over the night about what a wonderful thing it is for a nation to recognize contributions in this way, and not just the obvious military ones, but also intellectual, artistic, and cultural ones. I know the US President occasionally hands out some awards for cultural reasons, but in America, we just don't have anything this systematic and regular. Barbara's books and works have helped deepen the understanding and appreciation of a largely French body of artists, and the French government thanks her. If we did have this in the US, I wonder how we would even judge contributions to American culture: what is American culture? Wouldn't everything practically qualify? And I can only imagine that it would take a mere matter of minutes before the whole thing disintegrated into a political argument. In Japan, they designate certain artists and intellectuals -- in particular practitioners of dying arts -- "Living National Treasures". Given that so many artists live penniless and unappreciated until after their deaths, when suddenly they're lionized and their works sell for millions, there's something particularly lovely and touching about have somebody's body of work recognized and celebrated while they're still around to enjoy it. These French medals, and the ceremonies and speeches that accompany them, accomplish this in a very special way: One of the guests said it was almost like getting to hear your own eulogy -- essentially a Tom Sawyer moment. I am proud just being at the ceremony as an American in Paris, and I can only imagine how proud she feels to have her work recognized like this. It is a wonderful night, for a wonderful knight. Etoile, which means simple "star" is named for the obvious reason. This Etoile comes from the department of Deux-Sèvres, in the Poitou-Charentes region which, in my mind, pretty much lets you know right there that it's going to be a class-act cheese. 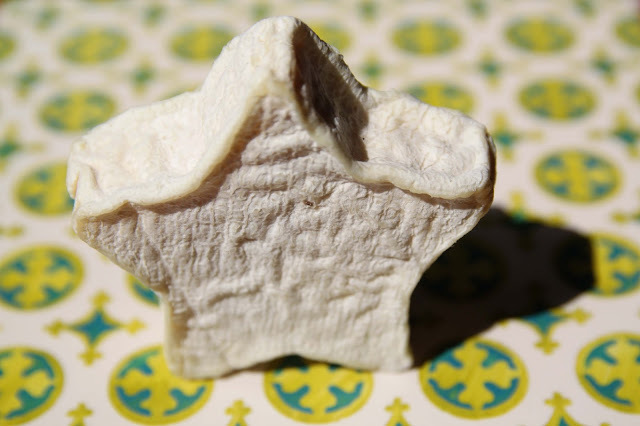 It seems like it would be just the same as another local Etoile, the Etoile de Gâtine, but it's not, mostly because the area of Deux-Sèvres reaches beyond the area of Gâtine, and, therefore, if this cheese is made outside of Gâtine, it can't be named after it. This Etoile seems like a drier, goatier version of the Etoile de Gâtine, though of course it's always possible that this is my specific sample. In any event, it's not only visually appealing and fun to cut (what shape should we go for next? ), it's also rich and creamy and thick, yet on the edge of crumbly. It's a fabulous cheese -- a real star of the platter, in every sense of the word. And speaking of platters, I know you're noticing this one, but that story will have to wait for another day. 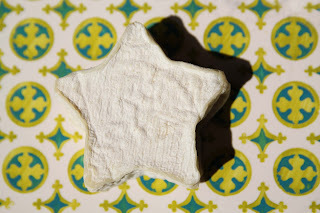 It seems like an obvious connection -- a star for the star -- but when I take this photo of a star-shaped and star-named cheese inside the almost star-shaped map of France, I actually don't have anything in mind; I just find the parallel shapes pleasing to the eye. Plus I get to use to my new cheese platter which deserves a posting to itself. But suddenly, after the ceremony, the fact that I've photographed it this way, inside the map, seems just so incredibly appropriate. As it happens, I also photograph my cheese on a new Portuguese platter, not knowing at the time what story I'm planning to use the cheese for, and it turns out that this too is a great visual tie in (important in a story about an art historian and artists) between the cheese and the honor bestowed upon her. The recurring motif on the platter practically looks like the medal. I hereby dub this the emblem of "the Green Cross of the Order of Delicious Goat Cheeses". It's not quite as exclusive as the emblem that Knight Barbara now gets to wear, but it should give all goat cheese something to strive for. And, finally, I actually break bread and this Etoile cheese with Barbara White. Rather, Knight White, that is.